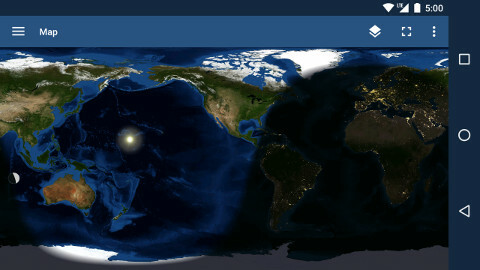 Watch the passage of time: a photo-realistic, global, real-time map of daylight and darkness, clouds and seasons. It's never the same view twice as the day/night line changes position from hour to hour, and changes shape from month to month. The interactive map can be accessed from the main TerraTime navigation menu; or, like the globe, it can be used as a live wallpaper on the home screen of any Android device (click if you need help with this).